Well, dear readers, my attempt at creating sourdough starter has finished, not with a bang, but more with a light popping sound. After getting frustrated and losing interest in the project, by the end of two weeks my would-be starter looked more like a soupy mess. But, after the sad outcome of my attempt at sourdough starter, I was yet determined to walk away from the whole thing with a loaf of non-alcoholic (read: beer not included) bread. So, off to my Yummylicious Pinterest Board I went and was completely smitten with this pin. Just LOOK at that bread! How could you not be drawn in by that photograph? The soothing teal and golden colors, the worn whitewashed country table, the toasty loaf that beckons you with all the promise of a few blissful moments of sweet and oat-y goodness. This bread really is delicious. 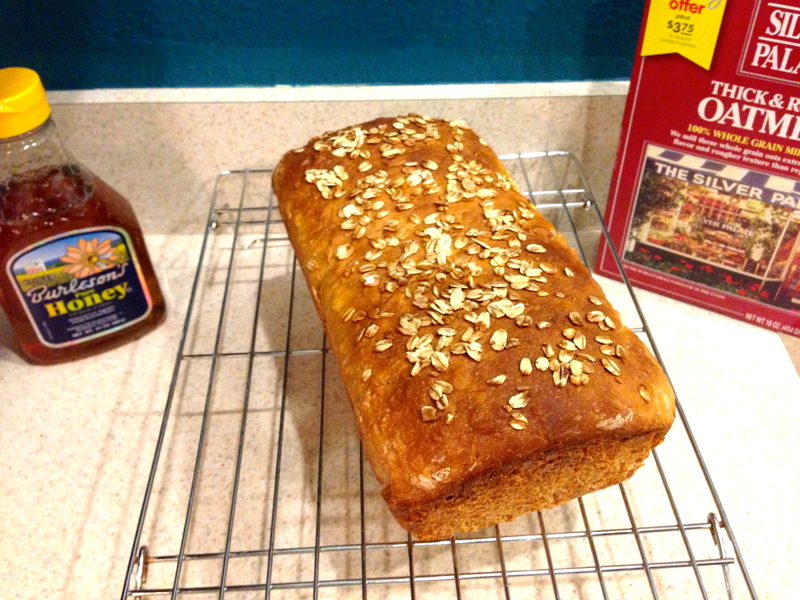 It is more on the sweet side, so I wouldn’t use it in place of regular sandwich bread. However, it is absolutely fantastic warm and smeared with butter and honey! It’s great for breakfast or a snack. I am beginning to believe that my kitchen may not be the most conducive environment to promote yeast growth. This recipe includes two separate rising times, once after the dough has been kneeded, and once after the loaf has been shaped and placed into the bread pan. In each instance, the recipe suggests that the rising time would be around an hour and a half. In this time, the dough should be doubling in size. Three hours into the first rising session, I pulled the dough out of the bowl and shaped it. It had risen a little, but was nowhere near doubled in size. After I shaped the loaf and put it into the pan, it allowed it to rise for eight hours before putting it in the oven. Just as before, it did rise, but was still not doubled in size by the time I baked it. However, it was late in the evening, and I was ready to go to bed. If (when) I make this bread again, I will probably start it around mid-morning with plans to let it rise the first time until evening, and once it has been shaped, allow it to rise overnight for the second time. Even with the long time from start to finish, this bread was definitely worth the wait! 2 Responses to "Sourdough Starter – Conclusion"
My sourdough starter lived on top of the fridge when it was growing but I do my bread rising in the linen/hot water tank cupboard sitting on top of the well insulated tank. The last little rise is often done on top of the oven while it heats up which also seems to work. Thanks for the info! I thought my kitchen was warm enough (you know, summer-like Texas Autumns), but probably not. Maybe next time I’ll try a warmer spot.